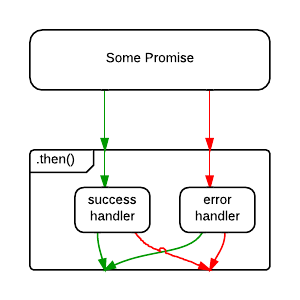 A promise is an object that may produce a single value some time in the future: either a resolved value, or a reason that it’s not resolved (e.g., a network error occurred). A promise may be in one of 3 possible states: fulfilled, rejected, or pending. Promise users can attach callbacks to handle the fulfilled value or the reason for rejection. Promises are eager, meaning that a promise will start doing whatever task you give it as soon as the promise constructor is invoked. If you need lazy, check out observables or tasks. Early implementations of promises and futures (a similar / related idea) began to appear in languages such as MultiLisp and Concurrent Prolog as early as the 1980’s. The use of the word “promise” was coined by Barbara Liskov and Liuba Shrira in 1988. Around the same time, Dojo added promises via the Deferred API. Growing interest and activity eventually led to the newly formed Promises/A specification designed to make various promises more interoperable. ES6 brought a Promises/A+ compliant Promise global, and some very important APIs were built on top of the new standard Promise support: notably the WHATWG Fetch spec and the Async Functions standard (a stage 3 draft at the time of this writing). The promises described here are those which are compatible with the Promises/A+ specification, with a focus on the ECMAScript standard Promise implementation. A promise is settled if it’s not pending (it has been resolved or rejected). Sometimes people use resolved and settled to mean the same thing: not pending. Once settled, a promise can not be resettled. Calling resolve() or reject() again will have no effect. The immutability of a settled promise is an important feature. Our wait(3000) call will wait 3000ms (3 seconds), and then log 'Hello!'. All spec-compatible promises define a .then() method which you use to pass handlers which can take the resolved or rejected value. The ES6 promise constructor takes a function. That function takes two parameters, resolve(), and reject(). In the example above, we’re only using resolve(), so I left reject() off the parameter list. Then we call setTimeout() to create the delay, and call resolve() when it’s finished. You can optionally resolve() or reject() with values, which will be passed to the callback functions attached with .then(). When I reject() with a value, I always pass an Error object. Generally I want two possible resolution states: the normal happy path, or an exception — anything that stops the normal happy path from happening. Passing an Error object makes that explicit. A promise or “thenable” is an object that supplies a standard-compliant .then() method. A pending promise may transition into a fulfilled or rejected state. A fulfilled or rejected promise is settled, and must not transition into any other state. Once a promise is settled, it must have a value (which may be undefined). That value must not change. Change in this context refers to identity (===) comparison. An object may be used as the fulfilled value, and object properties may mutate. Both onFulfilled() and onRejected() are optional. If the arguments supplied are not functions, they must be ignored. 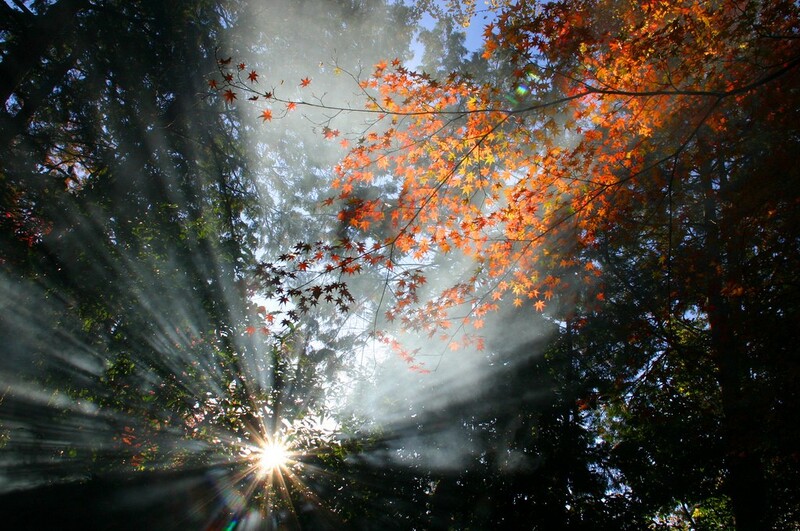 onFulfilled() will be called after the promise is fulfilled, with the promise’s value as the first argument. Neither onFulfilled() nor onRejected() may be called more than once. .then() may be called many times on the same promise. In other words, a promise can be used to aggregate callbacks. .then() must return a new promise, promise2. If onFulfilled() or onRejected() return a value x, and x is a promise, promise2 will lock in with (assume the same state and value as) x. Otherwise, promise2 will be fulfilled with the value of x. If either onFulfilled or onRejected throws an exception e, promise2 must be rejected with e as the reason. If onFulfilled is not a function and promise1 is fulfilled, promise2 must be fulfilled with the same value as promise1. If onRejected is not a function and promise1 is rejected, promise2 must be rejected with the same reason as promise1. Because .then() always returns a new promise, it’s possible to chain promises with precise control over how and where errors are handled. Promises allow you to mimic normal synchronous code’s try/catch behavior. Assuming each of the functions, fetch(), process(), and save() return promises, process() will wait for fetch() to complete before starting, and save() will wait for process() to complete before starting. handleErrors() will only run if any of the previous promises reject. But what happens if handleSuccess() throws an error? The promise returned from .then() will be rejected, but there’s nothing there to catch the rejection — meaning that an error in your app gets swallowed. Oops! The difference is subtle, but important. In the first example, an error originating in the save() operation will be caught, but an error originating in the handleSuccess() function will be swallowed. 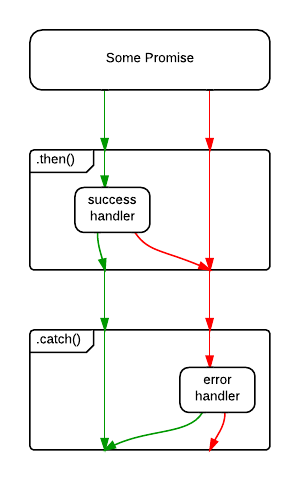 Without .catch(), an error in the success handler is uncaught. In the second example, .catch() will handle rejections from either save(), or handleSuccess(). I recommend ending all promise chains with a .catch(). How Do I Cancel a Promise? One of the first things new promise users often wonder about is how to cancel a promise. Here’s an idea: Just reject the promise with “Cancelled” as the reason. If you need to deal with it differently than a “normal” error, do your branching in your error handler. Adding .cancel() makes the promise non-standard, but it also violates another rule of promises: Only the function that creates the promise should be able to resolve, reject, or cancel the promise. Exposing it breaks that encapsulation, and encourages people to write code that manipulates the promise in places that shouldn't know about it. Avoid spaghetti and broken promises. Did you know that Chrome throws warning messages all over the console when you forget to handle a promise rejection? Oops! The withdrawn TC39 proposal for cancellation proposed a separate messaging channel for cancellations. It also used a new concept called a cancellation token. In my opinion, the solution would have considerably bloated the promise spec, and the only feature it would have provided that speculations don’t directly support is the separation of rejections and cancellations, which, IMO, is not necessary to begin with. Will you want to do switching depending on whether there is an exception, or a cancellation? Yes, absolutely. Is that the promise’s job? In my opinion, no, it’s not. Generally, I pass all the information the promise needs to determine how to resolve / reject / cancel at promise creation time. That way, there’s no need for a .cancel() method on a promise. You might be wondering how you could possibly know whether or not you’re going to cancel at promise creation time. If only there were some kind of object that could stand in for a potential value in the future… oh, wait. We’re using default parameter assignment to tell it not to cancel by default. That makes the cancel parameter conveniently optional. Then we set the timeout as we did before, but this time we capture the timeout’s ID so that we can clear it later. We use the cancel.then() method to handle the cancellation and resource cleanup. This will only run if the promise gets cancelled before it has a chance to resolve. If you cancel too late, you’ve missed your chance. That train has left the station. Note: You may be wondering what the noop() function is for. The word noop stands for no-op, meaning a function that does nothing. Without it, V8 will throw warnings: UnhandledPromiseRejectionWarning: Unhandled promise rejection. It’s a good idea to always handle promise rejections, even if your handler is a noop(). Reject the cancel promise by default — we don’t want to cancel or throw errors if no cancel promise gets passed in. Remember to perform cleanup when you reject for cancellations. Note that this example is just an illustration to give you the gist of how it works. There are some other edge cases you need to take into consideration. For example, in this version, handleCancel will be called if you cancel the promise after it is already settled. I’ve implemented a maintained production version of this with edge cases covered as the open source library, Speculation. This simplifies things a little, because you don’t have to worry about the noop(), catching errors in your onCancel(), function or other edge cases. Those details have been abstracted away by speculation(). Check it out and feel free to use it in real projects. Promise.reject() returns a rejected promise. Promise.resolve() returns a resolved promise. Promise.race() takes an array (or any iterable) and returns a promise that resolves with the value of the first resolved promise in the iterable, or rejects with the reason of the first promise that rejects. Promise.all() takes an array (or any iterable) and returns a promise that resolves when all of the promises in the iterable argument have resolved, or rejects with the reason of the first passed promise that rejects. For instance, if you’re using Redux, I suggest that you check out redux-saga: A library used to manage side-effects in Redux which depends on async functions throughout the documentation. I hope even experienced promise users have a better understanding of what promises are and how they work, and how to use them better after reading this. Barbara Liskov; Liuba Shrira (1988). “Promises: Linguistic Support for Efficient Asynchronous Procedure Calls in Distributed Systems”. Proceedings of the SIGPLAN ’88 Conference on Programming Language Design and Implementation; Atlanta, Georgia, United States, pp. 260–267. ISBN 0–89791–269–1, published by ACM. Also published in ACM SIGPLAN Notices, Volume 23, Issue 7, July 1988.